So after a weekend beach trip that led to a last minute pit stop at a Delaware farm stand, I somehow ended up with a refrigerator full of zucchini. For a week I had it baked, broiled, roasted, toasted, and caked, and I somehow still had some of this veggie left. Before I threw in the towel and forced the food upon my roommates, I realized that despite my weeklong zucchini fest, I still forgot to make my favorite recipe with it: zucchini bread. For those of you who now think I’m crazy, it’s kind of the same concept as banana bread, except you don’t really taste it. 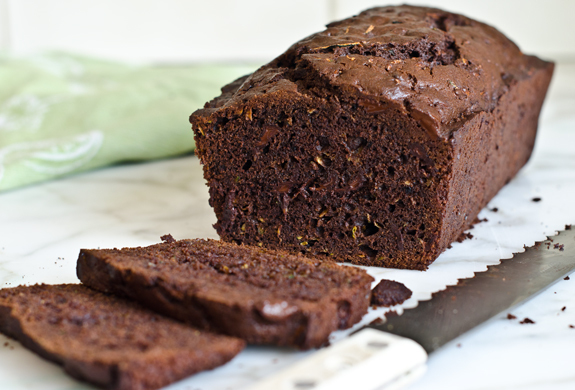 It just turns out into this moist yummy breakfasty bread that you will gobble up. Because seriously, this stuff is amazing. Chocolate is theoretically optional in this recipe (and its actually quite good without any chocolate), but who sees chocolate as optional?? Preheat the oven to 350 degrees and grease an 8-1/2″ x 4-1/2″ loaf pan with nonstick cooking spray. Whisk together the flour, cocoa powder, salt, baking powder and baking soda in a medium bowl. Add to the butter mixture and stir until well combined. It will be very thick. Spoon the batter into the prepared loaf pan and spread evenly. Bake for 60-65 minutes, or until a toothpick or cake tester inserted into the center comes out clean (save for perhaps a smear from the melted chocolate chips). Let the loaf cool on a rack for about 10 minutes before turning out onto a rack to cool completely.